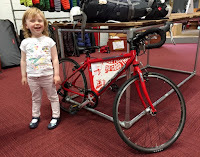 In trying to help her complete the 'play' task she'd started, it became tantalisingly apparent that yes, Thomas Ivor's top tube bag did fit nicely in the Cnoc 16's frame, and yes, you could strap a drybag to the handlebars without impeding the function of the brakes... and good grief! The seat pack fits under her saddle, too! Before any of us knew it, we had stuffed some down jackets in the bags and were out at the bandstand, little Ruth lapping with tremendous fervour. A little boy on a kick scooter tried to race her, and that was it - she was off like a miniature, female, cycle touring Jeremy Clarkson. I've written before about giving little children opportunities that others might think beyond them, but a bit like the cadence sensor when I taught Thomas Ivor to change gear, this one came as if from nowhere. 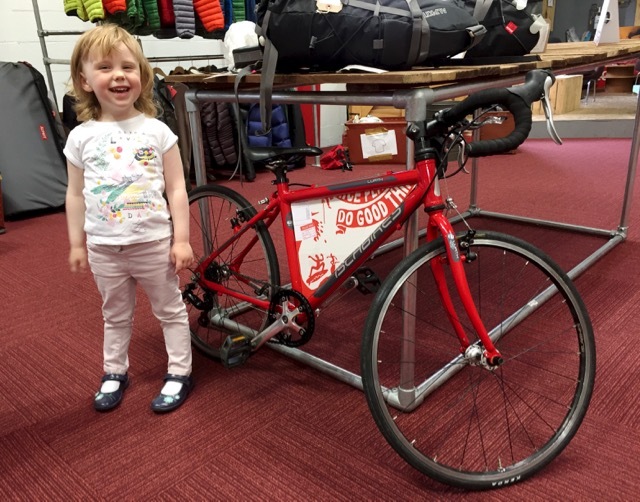 It's only last June when Ruth was helping to hold her big brother's bike when 'King Louis' was being measured for a frame bag, and here we were witnessing another seminal moment. 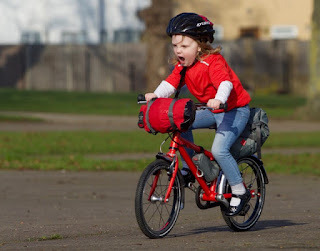 I mean, why shouldn't a little girl of just turned four have a set of bikepacking bags? The next day we found ourselves in Newthorpe once more, and this time it was 'Merida's turn (it would seem so to have been named!) for 'the treatment' (see below for spec list). Children love carrying something on their bike, especially when everyone else is. Family life is a team sport, and they feed off feeling like they are an integral part of the mission. 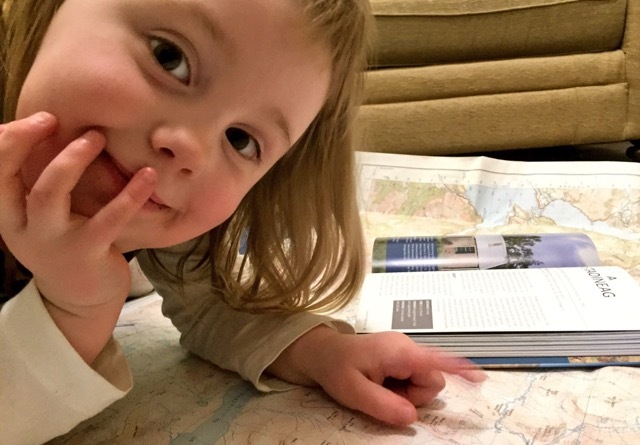 In this case, Ruth has decided that now she has the bags, she wants to go 'bothying' even more than she did before (which was a LOT), so we've had the maps out and have a plan in development. 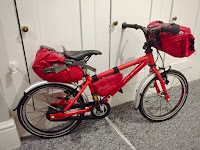 When we tour longer distances, we'll still use her trailerbike to make sure we cover the ground and stay safe on the road, at which she will have a pair of panniers on her rear rack, once more feeling like she's part of the team. She can probably use her 'frame bag' off her Cnoc as a top tube bag on her trailer bike. A ride out today, five miles or so, with Daddy on foot and Rhoda on her balance bike, has proved that the Cnoc remains stable, handles fine, and most of all that the little girl at the helm of what looks every inch a touring machine is exceptionally proud of herself, to the point of stopping to tell everyone coming the other way that she was carrying her sleeping bag! 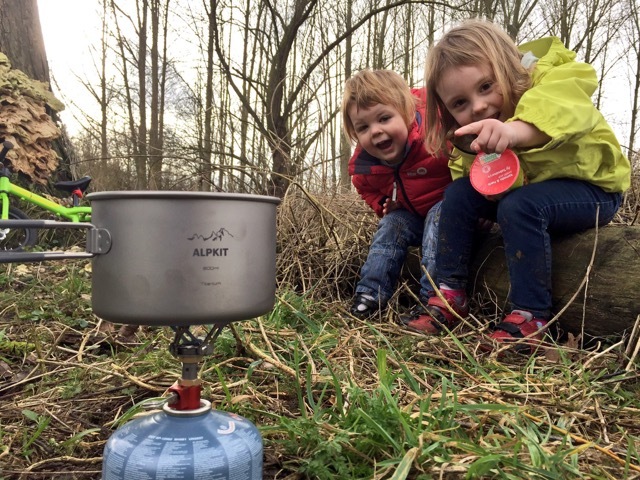 We had a little play with our new Alpkit Krakau stove as well today, and had a hot snack next to the river, on the edge of the woodland where Mummy and Daddy went canoe camping last summer. A very productive couple of days, which we never saw coming! Above all, a lesson in 'going with the flow'; of letting the children lead when it comes to their adventures and their kit - because if they, like you, don't enjoy it, you probably should be doing something else. Bar bag: Alpkit Airlok Extra Dry Bag (£12) with Dual Straps (£5) - contains Alpkit 'Cloud Cover' down-filled blanket for sleeping in. 'Frame bag': An upturned Alpkit Small Fuel Pod (now discontinued and replaced with a slightly different shape. Luckily found one in their bargain bin for £12 which fits perfectly!) - contains spare inner tube, and possibly a favourite pebble. Seat pack: Alpkit Small Koala (was called the 'Wombat' originally - review here) - £70 (some in the bargain bin with minor imperfections for £40 if you don't mind grey or yellow at the time of writing!) - contains Spotty Otter Drift Down II combo jacket. That's less than the cost of two nights in a Premier Inn - excitement aside, by your third night in the bothy, you're quids in! This sounds brilliant fun - there is so much that pre-schoolers can do, but we tend to think they're not capable. 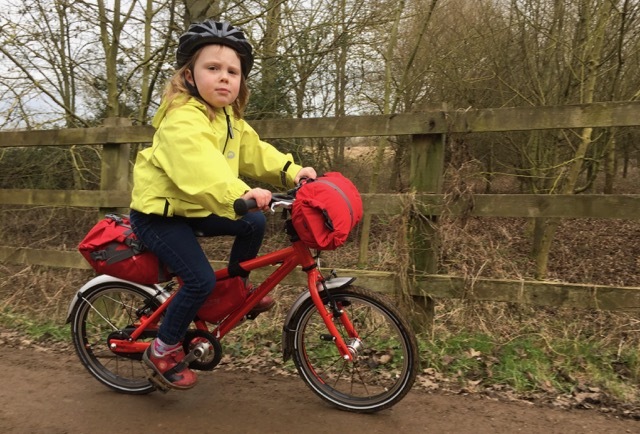 I missed that chance to do bikepacking when mine were younger, but we're hoping to do some this summer - they're on the bigger Islabikes now! 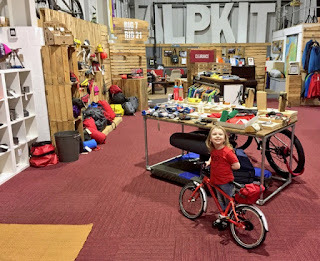 Hi, what is the link for the Alpkit with imperfection, cheaper. 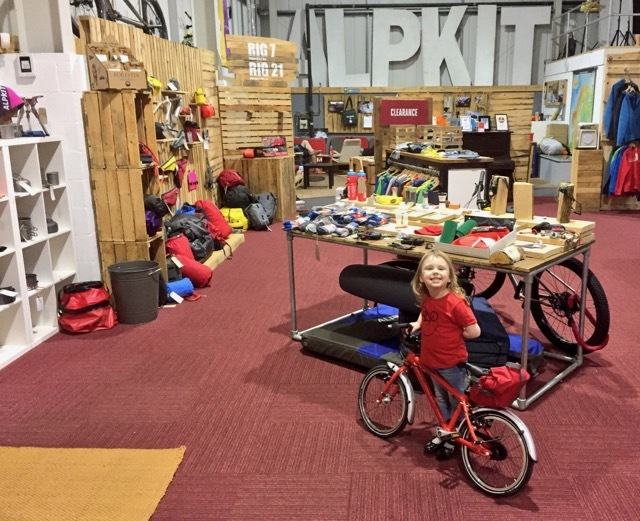 I'm afraid you have to go to Alpkit's shop just off the M1 near Nottingham in person for the bargain bin! 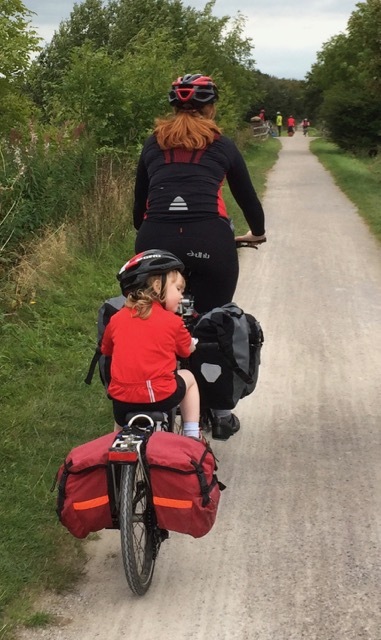 We used a swivel mount bottle cage so the boy could carry his own drink before his frame was big enough for normal bottle access.A super light saddle bag held spare tube. His little life back pack / reins had many further years of use as an mtb pack so he could carry own coat and snack. Kids love to carry something! It's a great start to get them carrying their own spare tubes, because they'll be a different size and that also makes sure they're with the right bike. Thanks, this is great. 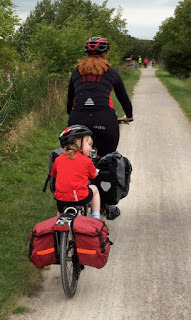 Our two (now on slightly bigger Islabikes) were wondering about saddle and bar bags just last week, to save carrying a rucksack, so this is exceptionally useful. Seems like a fun activity for a family! Its like camping but safer from the elements. And must've been fun for little children. Great idea!